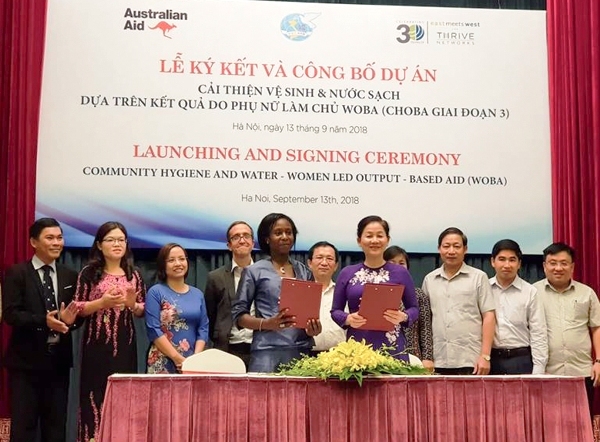 On 13 September 2018 in Hanoi, the Signing ceremony of Woman led improved water and sanitation output based approach WOBA-CHOBA phase 3 2018-2022 was be held between Vietnam Women Union and East Meets Weast/ Thrive network supported by Australian Aid. Participated in the ceremony were representaives from DFAT, EMW, VWU, NCERWASS, VIHEMA, PPC from project provinces: Hòa Bình, Thanh Hóa, Nghệ An, Hà Tĩnh and Bến Tre. The project is under the Women water Fund under DFAT and implemented by VWU and EMW during 2018 – 2022. NCERWASS and VIHEMA accordingly will co implement the water and sanitation components in 5 provinces (17 districts and 158 communes) with total 31,7 billion đồng, supporting 8.000 poor and disadvantaged households to access clean water and 20.000 households access hygien latrines. According to Belinda Abraham, Country Director of the East Meets West Foundation, "People in rural areas have the same access to clean water as people in urban areas. Many people think that the construction of clean water supply facilities in the countryside is expensive, but the Department for Foreign Trade of Australia and Vietnam has always paid attention to clean water in the countryside. " The project is aimed at improving the health and gender equality of low-income and vulnerable households in Viet Nam through access to clean water and hygienic latrines. With a result-based approach by local government counterparts, private sector participation and empowerment of women.